Matching up with the ever increasing requirements of the customers, our company is engaged in providing Silver Gents Bracelet. 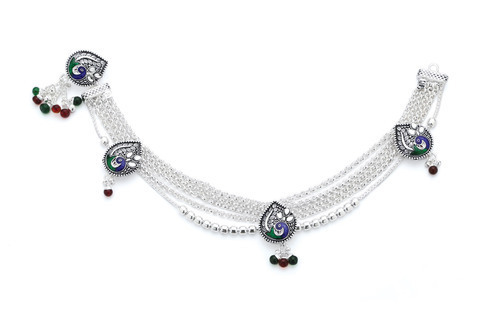 We are a leading Manufacturer and Supplier of an elegant collection of Ladies Payal, Sterling Silver Jewellery, Juda Pins, Ladies Belly Belt, etc. Offered range is appreciated due to its attractive design and flawless finish. We are actively engaged in Manufacturing and Supplying a broad assortment of Ladies Payal, Sterling Silver Jewellery, Juda Pins, Ladies Belly Belt, Ladies Bangle And Bracelet, Ladies Ring, Ladies Toe Rings, etc. The offered jewellery range is designed using pure silver and cutting-edge technology as per the set quality norms. Provided jewellery is immensely acknowledged for its modern design, unique look, flawless finish, stylish work and long lasting finish. Clients can avail this jewellery collection from us in various designs and patterns at reasonable prices. We are delivering minimum 1 Kg quantity of mix products.